Founding a startup requires a relatively high performance in a large number of relatively unrelated areas. Besides being good enough at product and problem solving to make something people actually want, you also have to be good enough at hiring, managing, fundraising, sales, marketing, culture-building, and much more. Not to mention specific areas of expertise you might need to master depending on your domain such as security, supply chain management, manufacturing, or whatever else applies. And especially not mentioning the skill of managing your own psychology well enough to guide your team through the years of inevitable ups and downs. This is one of the reasons I think having some work experience is so helpful before starting a company. You don't need to wait until you've acquired every possible skill before starting a company, but if you're already proficient in multiple of these areas before you get started you have that much less to learn on the job. It's also one of the reasons I've come to believe that more startups should hire a COO than probably do. Of course they will not be right for every company -- maybe not even most companies -- but my current view is that every startup that reaches product market fit  should at least consider whether it's right for them. COOs are a poorly understood role, both because they do different things at different companies, and because people simply don't talk about them that much (although there is definitely good content out there like this video with Keith Rabois and this interview we did with Claire Hughes Johnson). I want to share my very positive experience with hiring a COO so others can consider whether a similar role would make sense in their situation. We hired J Zac Stein, former VP of Operations at Zenefits, as our COO in November 2017 when we were just over 20 people. The idea was that he would be a general purpose business athlete who could run a function for a while, build up a strong foundation, leave it with great leadership, and then move on to the next thing. An executive "gap filler", as Elad Gil described in a recent blog post advocating for something similar. He's overseen the sales team through a leadership transition, allowing me to run a multi-month process to hire a new head of sales. Not only did the sales team grow our revenue by over 100% in the past 6 months, but they've also added early versions of sales development and sales operations. He's built up and led our customer experience team, as well as made the decision to bifurcate the team into customer success and customer support. This was a core area of expertise for him coming into the job and it's given me the freedom to work on other areas knowing it's in better hands than it was with me. He's been a one-stop-shop for legal, finance, analytics, and HR (aided by contractors), allowing us to not only hold off on hiring those roles, but also to have a much more experienced set of eyes on them than we would have with more junior hires. Now that our new sales leader is joining, he's overseeing marketing where he can apply operational rigor and managerial guidance. This allows us to continue betting on our less experienced but extremely talented head of marketing, which is very important to me. So he's served as multiple VP functions, both at once and over time. Arguably, a dedicated VP in each area would do slightly better because they wouldn't be spread so thinly and would be a functional expert. There is some truth in that, but it comes at the cost of countless hours of hiring, integrating into the team, managing multiple personalities, and other related trade-offs. And potentially more importantly, the "executive gap-filler" role allows for much faster adjustment of organizational structure, strategy and tactics, and all sort of other organizational frictions you get with VPs who were hired on for a more specific purpose. When you're still early in your company's life, this flexibility is extremely valuable. Why don't early stage startups hire COOs more often? Part of the reason people don't hire COOs early is that it's simply not on the list of hires we're taught to consider. Everyone knows that early on you hire engineers and designers to build the product, sales reps and marketers to bring customers on board, and people to support your existing customers. As you start getting traction and grow your team, you hire managers, and as things become more complex and strategic you hire VPs. But there is less canonical knowledge and public discussion about the COO role, and a result founders often just don't even think about whether it's right for their company or not. The other main reason is that people are often anxious about hiring roles with so much influence. Whether it's because of the sense of loss of control and influence, the fear of getting the hire wrong, or the relatively high expense of hiring a COO, there are many of these kinds of anxieties that give founders pause. Yes, nothing in life is totally free and you will have to give up something to have this kind of person on your team. But great people pay for themselves many times over, great COOs know how to make their CEOs comfortable with their broad scope, and if things truly don't work you should trust yourself to make the difficult but necessary decision to part ways. Great leaders are supposed to hire great people and give them lots of responsibility . That's your most important job. It's how you scale and it's what's required in order to build something great. In a startup environment, trust is largely a function of understanding a person's motivations and believing they are aligned with the company's and your own. Trusting the other person to be a reliable steward for the company's interests is built over time spent together, repeated interactions through challenging business questions, and an open line of communication. Relatedly, mutual respect is critical because there's simply too much going on to be in each other's business and second guessing each other's decisions. The CEO and COO should be thought partners to spar with each other on challenging decisions, but ultimately need to have the respect for one another to be willing to "disagree and commit" when necessary. Ego isn't inherently bad. It gives people the confidence to take on projects they aren't quite ready for, do things like start a company, and generally maintain a positive sense of self. However, in the CEO/COO relationship, you have to be careful to not let ego get in the way if you want it to be successful. As CEO, you fundamentally need to have the humility to admit you hired this person for a reason and will be allowing them to run a large portion of the company. This requires elevating your COO in the eyes of your company to allow them the authority and influence to do their job, and it means handing off functions that you might enjoy leading because you know it's better for the company. As COO it means towing the line between the ego required to accept that level of responsibility and the humility required to still respect the CEO's role. If things like handing off functions when necessary are going to be stopped by either person's ego, the relationship just won't work. Geoff Donaker, who was COO at Yelp through a decade of meteoric growth, once sat down with me and J Zac and white-boarded out the three possible relationship configurations for the CEO and COO. One is the "Ted Turner model", where the COO essentially runs the company internally and the CEO is an external figurehead. This works only in the rare cases when the CEO is influential enough for this to be a valuable use of time. The second is the "two parent model", where both executives are equally responsible for everything. This generally leads to organization confusion, friction, and one of the two executives leaving the company. The third configuration, which he described as the only stable one for startups and is certainly what we are going for, is one of clear delineation of responsibility. The COO runs several functions and the CEO runs several functions. Everyone in the company is clear on what those are, and while the CEO and COO advise each other on challenging questions there is no doubt about who is the decision-maker for a given issue. Finally, I think it's critical for the CEO and COO to enjoy each other's company. It's simply too much time together, too many things you need to discuss, and too many issues that are intellectually and emotionally challenging that you will go through together. The relationship won't work if you don't actively enjoy each other on a personal level. You shouldn't start a company with a cofounder you didn't enjoy being around, and the same thing goes here. One final thought for founders considering this role (or other very senior roles) is to remember the human truth that the more ownership and responsibility you give someone, the more they're going to care. Being a founder can be a lonely job, and bringing on an executive who grows to deeply care about your company makes the job a little less lonely. My favorite working definition of product market fit is the ability to hire a stranger who can sell your product to another stranger in a repeatable way. YMMV but this framework has been helpful for me. As an aside, I think people are often afraid of hiring people truly great people and giving them lots of control and responsibility. This is an especially common pitfall for first-time managers who are afraid that if they hire and enable someone who is too good at their job they will lose their job to them. In practice this never happens, and the exact opposite is the case; the hallmark of a great manager is someone who builds and empowers a great team, and anyone who knows what they're doing will evaluate a manager that way. The other day, my uberX driver told me that he'd been unemployed for almost a year. He started driving last month, and now he can pay his rent and work whenever he wants. A friend of mine makes his living as a full time renter on Airbnb, effectively acting like a hotel while he travels around world with the profits. At Teespring, some of our most successful sellers are programmers who left their high-paying jobs because the opportunity to build their own business on top of Teespring was more appealing. There's an interesting link between many successful startups that gets surprisingly little attention. It was a foreign concept before the rise of the internet, and now I believe it is one of the driving forces behind the growth of Airbnb, Uber, Teespring, Postmates, Patreon, Verbling, and many more. Companies can now empower people to create their own jobs. This is a huge deal and has major implications. Job creation gives employees their livelihood, it gives companies champions who fight to make them succeed, and it gives economies legs to stand on. For employees, it used to be the case that to get a job, you had to be hired; now you don't. Companies now have the ability to create jobs not only internally but externally, and they can increase the size of their workforce much more quickly. At Teespring we have just over 100 employees, but hundreds of sellers are making their living with our product, and thousands more are getting close. Uber is creating 20,000 jobs per month, a rate of expansion that simply wouldn't be possible with normal hiring models. Perhaps even more interestingly, there is also a way to empower people to create their own jobs even when it’s not all about your own platform. While the companies mentioned above are built on the users who make it their full-time business to sell services through the platforms, it is also possible to create jobs for users on other platforms. Consider companies like Instagram, YouTube, and Wordpress; the very top creators on these platforms certainly make good livings, but the majority of them don't. Figuring out how to give more of these users the ability to earn money is a massive opportunity, and unlocking this potential will establish a new degree of engagement on these platforms. The companies that figure out how to help users on these platforms turn their passion into profession will do very well. Creating jobs is a powerful force, and the rise of ubiquitous and mobile connectivity has given companies an entirely new ability to create jobs remotely and scalably. The companies that see the power in this and figure out how to leverage it will do well. It seems like almost every day now I see someone who believes we are in the midst of tech bubble (a world in which companies are valued far above their true worth). The most common arguments people mention are 1) startup valuations are massive and dissociated from underlying value 2) public technology companies are overpriced, and 3) MBA-types are moving to Silicon Valley to get a piece of the gold rush. In this post I will address each of these points and argue that we are not in a bubble. Argument: Nosebleed startup valuations are the most commonly cited indication that we are in a bubble. Airbnb and Dropbox are valued at $10 billion each. Snapchat and Pinterest are valued at $4 billion each and they don’t even have revenue. Facebook bought Oculus for $2 billion before consumers could even get their hands on the product. Whatsapp is just a joke. Most people have become comfortable with the idea that even though young startups are likely to fail, seemingly high valuation can be reasonable if there’s a sufficiently likelihood of success. Early stage venture investing follows a power law, and the billion dollar outcomes can justify valuations for a whole set of startups. This is why two founders with an idea and a prototype can raise money at a $5 million valuation; early stage startups are treated as part of a basket. For mature companies like Microsoft, valuation is best understood on an individual company basis, as a discounted stream of future cash flows. Huge companies trade at a reasonable multiple of their earnings because dramatic growth is typically out of the question. I believe the mental error here is categorization. When people criticize multi-billion dollar valuations, they are bucketing them alongside mature public companies, when really they should still be considered as a basket that will follow a power law of outcomes. The right question is not “is Snapchat worth $4 billion?”, but rather, “is there a 10% chance Snapchat is worth $40 billion?” . We live in a world with over 1.5 billion smartphones and more sophisticated technology than ever before, which means startup potential is greater than ever. When you combine this with an understanding of these companies as part of an overall basket, multi-billion dollar startup valuations seem reasonable. Argument: Tech high-flyers like LinkedIn and Netflix are trading at hundreds of times their earnings. We are seeing the most new tech IPOs since the tech bubble in 1999, and many of them are for companies that are quickly burning cash. The NASDAQ is closing in on its all-time highs from 1999 bubble, and the small-cap tech stocks are at some of their highest P/E ratios ever. There is some truth here; tech stocks are expensive right now by any measure. However, that doesn’t mean they’re overpriced. While it’s true that younger smaller tech companies are richly priced, the mature tech companies like Microsoft, Google, Apple, Cisco, Yahoo, etc. are trading at very reasonable levels. Also, younger, struggling companies like Groupon, Zynga, and King have stock prices that reflect their situations. Investors are evaluating each company on an individual basis and valuing businesses that at least make sense and have workable business models. This is very different than the last bubble when companies erroneous business models got great valuations as long as they were “tech”, and mature companies valuations were rising with the rest of the tide. What we really have in the public tech markets is highly priced young companies and moderately priced mature companies. If you believe that some of the young companies are poised to disrupt the incumbents, or if you take a basket view to young tech companies, then public market valuations aren’t so scary. Argument: Five years ago, consultants were competing to get into business school, MBAs were funneling back out to Wall Street, and bankers were quitting to work at PE funds. Now, everyone is just joining a startup. With this argument, the premise is true; more people are starting and joining startups than ever before, and they’re coming from a much more diverse set of backgrounds. What’s not necessarily true is the conclusion, that this migration of talent is a bad thing that indicates a tech bubble. The largest new source of tech workers is the veterans of banks, consulting firms, and business schools. This demographic is widely assumed to be “in it for the money”, and so skeptics believe they will be unable to build the revolutionary companies that drive innovation forward and create massive value. I have a more optimistic view ; I think the majority of this crowd was unsure what they wanted to do, but knew they wanted to work hard and feel important. It seems plausible then that they could discover the startup world a little late and fall in love with it just like anyone else. Instead of viewing this influx of workers as a sign of a bubble, it should be viewed as the logical extension of an increasing attractive industry in a country with fluid labor allocation. A bubble is one of those things that can only be identified in hindsight, not because we don’t have enough information right now to know, but because it has not yet been determined. If companies collapse and lose their ability to grow and earn money, then we will have been in a bubble. If enough startups succeed in the ways we hope and expect, then we will not have been in a bubble. I believe the latter is more likely to be true, that tech is poised to continue on a trajectory of massive growth. The market for startups today is different than it has ever been. Over a billion people have a computer in their pocket at all times, and billions more have access to the internet. Software can be deployed from the cloud and run on a massive scale instantly. Industries that never used technology before are welcoming software into their businesses with open arms. Large amounts of capital are available to startups at every stage, and there is a bigger pool of talent wanting to work in startups than ever before. Yes, capital is plentiful and cheap, expectations are high, and new tech workers are flooding in from every corner of New York. This may scream, “bubble!” to you, but remember that technology is not zero-sum game. All of this could very well signal the influx of capital and labor that is necessary to create a virtuous cycle that can grow an industry at a massive scale. In fact, the bar is even lower. The real question should be is the integral of graph of probability vs. outcome worth more than $4 billion. As a side note, although on some level I understand the reaction to be skeptical of MBAs entering startups, I think it’s an unsubstantiated bias and drives an unwelcoming culture that we should not encourage. So far during my time at Teespring, my most striking observation has been the importance of great customer service. Every conversation at work is laced with the subtext of improving customers’ experience, and every employee does customer service at one point or another. Good customer service helps you understand your customers, define your company, and grow your business, and should be nurtured carefully. Every single employee at Amazon - even Jeff Bezos - spends at least two days per year doing customer service. A lot of interesting things start to happen when people from every part of a company take the time to interface directly with customers. Maybe a product person realizes a clearer way to present users with the information they care about, or an operations person recognizes that a certain supplier is causing too many problems. In these kinds of ways, customer service helps you define your business. When the entire company is relentlessly focused on serving customers, the company's value proposition tends to increase. Great customer service is not just a department, it’s a characteristic of a company that focuses on its customer’s needs and works backwards from there. It should appear in all parts of the company, the way that the DNA encoding your eye color can be found in every one of your cells. Good customer service can do as much to grow your company as any other avenue. Not only does it increase your user retention by keeping existing customers happy, but it also creates an army of advocates who will tell their friends by word of mouth how much they enjoyed their experience. As a driver of growth, word of mouth has a very special quality; as your service grows, you get more advocates. Ideally, you retain a constant ratio of advocates to users; e.g. 20% of your users generate a new user in any given month. This is why startups with very happy customers tend to grow exponentially. Growth is the silver bullet that solves all problems in a startup, and customer service is one of the best ways to get growth. Customer service is an essential business function. In fact, customer service is the essential business function; serving customers is what makes you a business. Because of this, it deserves incredible attention. Too often, people dismiss customer service as one of the softer sides of business. Decent customer service is easy, but great customer service is hard - companies like Amazon pour massive time and financial resources into getting it right. There is an erroneous tendency to give less credit to activities that have a lower barrier to entry. Anyone can play chess, but becoming a grand master is extremely difficult. Even though customer service is easy to do moderately, companies should invest heavily in doing it well. We often hear that America spends an exorbitant amount of money on healthcare, but people rarely stop to think how much it is or what that means. In 2011, the United States spent 17.9% of its GDP (over $2.6 trillion) on healthcare. To give it some context, our peers in the 18% range are Liberia and Sierra Leone. In the 10-11% range are countries like France, Canada, Denmark, Germany, Switzerland, Austria, Portugal and New Zealand. Down closer to 7-8% are Uruguay, Croatia, Hungary, Chile, Cyprus, Bulgaria, Vietnam, Poland, and Turkey. Between 3-5% are countries including Singapore, Sri Lanka, United Arab Emirates, Algeria, India, and Thailand. We spend about $8,800 per citizen, which is surpassed only by Switzerland, Norway, Luxembourg (which all have higher per capital incomes), and is more than double what most of the developed world spends. If we could cut spending by just 1% of GDP, that would save us over $150 billion per year. Cutting 7%, getting us in line with our peers in the developed world, would save over a $1 trillion per year. 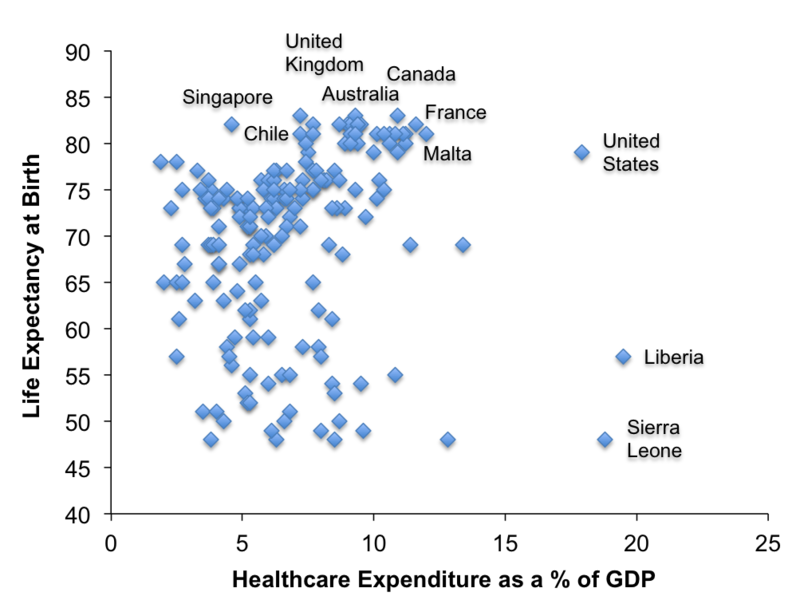 This is a graph I constructed with data I pulled from worldbank.org, plotting life expectancy at birth against a country's healthcare expenditure as a percentage of GDP. Why is the United States sitting at the intersection of the developed world and Liberia and Sierra Leone? What this graph doesn't show is that these costs are running away. We spent 17.9% in 2011 compared to 16.6% in 2008, and all experts predict this number will continue growing. Obviously, life expectancy is a rough indicator of the effectiveness of a healthcare system and there are a lot of conflating factors. But you'd expect this most basic goal of healthcare - keeping people alive - to improve with higher expenditure. Moral hazard is a huge part of the problem; the third-party payer system is crippling our economy. When medical bills are footed by insurance companies the pricing system gets completely out of whack. Drug companies charge $50,000 for a single chemotherapy treatment, an IV drip whose cost is defended by years of research and development. An MRI in the US can cost anywhere between two and eight thousand (good luck finding out exactly how much) - in France, by comparison, it costs a few hundred. A single-party payer system, or more pejoratively, "nationalized healthcare", has drawbacks. For example, wait times for elective treatment go up (just ask a disgruntled Canadian), and the government has to become integrally involved, which Americans tend to react negatively to (despite the fact that the data says it's better in almost all dimensions). But the truth is that there's good reason for healthcare to be nationalized. I'm no great liberal; I am all for taxing cigarette smoking, motorcycle driving, and maybe even obesity. But why do people not see that healthcare is one of the few areas that makes sense - theoretical, academic, and practical sense - to have a highly involved government? Healthcare is an inherently irrational market, where patients routinely act based on emotions rather than logic, and where the costs of decisions made by one person fall on someone else's shoulders. Externalities run high, payoffs and outcomes are unclear at best, and the philosophical backdrop for the whole system is closer to liberty than to capitalism. Everything about my economics degree tells me this is the textbook entry point for government. Aside from the system itself, the worst offenders are probably insurance and pharmaceutical companies. But doctors are not without blame either. Hospitalized patients feel incredibly price inelastic (since the money doesn't come out of their pocket) and will pay for basically whatever their doctor recommends. Even the best-intentioned doctors may tend to recommend treatments that are more expensive and will give them a bigger payout, especially if they think that treatment is marginally more effective (and not all doctors have the best intentions). Despite our obscene healthcare expenditure, almost 50 million Americans still don't have health insurance. Why do we have the general understanding that free speech, gay marriage, and social equality are part of a civilized and compassionate society, but somehow universal healthcare is not? We all agree that everyone has the right to food, water, and air; why do we draw the line before basic medicine and healthcare? As a worldview, I think it's barbaric. And why are we still on a system where healthcare is tied to employment? This is a 70 year old mechanism that was installed during World War II to avoid regulations on wages and prices. This worked well back then, when employees stayed at one company for decades or life. Today's average American changes jobs a dozen times over a career, and so tethering healthcare to employment makes little sense. When Americans lose their jobs, they and their families are taken out of the healthcare system, which becomes a complete mess when they have preexisting conditions (although Obamacare is slated to fix this). At this point you can probably guess that I support nationalized healthcare, but I recognize that that won't happen. There are too many people in positions of authority that are incentivized to block this change. Even more difficult to overcome is the national sentiment of "this is America where we work to buy our own healthcare, leave socialism to those lazy Canadians." These self-described capitalists apparently refuse to look at healthcare data in the rest of the world. We can still make meaningful changes within the system. We can figure out how to align incentives so doctors and drug companies aren't incentivized to over-treat patients (or, more sinister, prevent the cure of profitable diseases). We can address the tricky problems with end of life care, which drain hundred of billions of dollars per year to keep many patients miserable and bed-ridden. We can change regulations for pharmaceutical companies, create clearer pricing schemes at hospitals, and reduce friction throughout payment systems. America's obesity is clearly a huge part of the problem, but regulating calorie consumption doesn't go over well (thanks for trying Mayor Bloomberg). I also think there are new innovations on the way that could dramatically change healthcare costs. Real-time blood monitoring, where an implant in your bloodstream could send a notification to your iPhone when something was wrong, promises to reinvent preventative medicine (which admittedly has its own set of problems). Software technology companies are in the process of streamlining and automating healthcare systems, which will save billions. Right now, I think the most important thing we can do is begin a cultural shift to make people care about the problem of healthcare expenditure, which begins by articulating the issues. It's lucky that we live in a country where popular consensus dictates policy, but it's a shame that Americans don't know enough to fight for substantive changes. Startups can always identify their competition. If they're in a worthwhile market, they have competitors, and they know who they are. Surprisingly, I have found that many startups can't pinpoint the way in which they compete, and many more haven't thought deeply about why they should compete in that particular way. Startups can compete in three main dimensions; quality, convenience, and price. As startups grow, they gain resources, leverage and market share, which allows them to compete in more ways than one (Airbnb is an example of startup that often beats hotels at all three). However, early stage startups usually only have the ability to compete in one dimension well. It's usually not that difficult to figure out how best to compete, and it's critically important. Knowing the company's key dimension of competition is on the short list of things everyone at a startup should know at any given point (other items on the list include short-term goals and critical metrics). Intuition and empirical examples typically lead to the same conclusions and should allow founders to extrapolate the best way for their startup to compete. From what I've seen, startups often prefer to compete on quality; it's everyone dream to offer a truly better solution than anything else that exists. Marc Andreessen said that to be successful, startups have to offer a solution that is 10X better than existing solutions. Startups should compete on quality only when they actually have something is that is 10X better than existing solutions. This requires a very honest look at your product and market. Can you really provide users with a product that is so much better than everything else on the market that nothing else matters? If you are, great. If you aren't, that's okay - you can still be successful, you just have to compete differently. Competing on convenience makes sense when two conditions are sufficiently satisfied: 1) demand for a solution is price-inelastic and 2) existing solutions are inconvenient. Uber is a great example of a startup that competes with other car services on convenience. Uber has been successful because it is so much more convenient than any other transportation solution, not because of cheap prices or unbeatable high quality. People need to get around and they will pay to do it, so competing on convenience makes sense in this market. Startups can successfully compete on price when one of two conditions is satisfied: either 1) existing market prices are artificially high for some reason, or 2) when offering a solution at a cheaper price will gain sufficient market share to ultimately drive the company's success. Warby Parker's value proposition and success has come from competing on price, and they have been able to do so because of artificially high market prices. The international conglomerate Luxottica had a stranglehold on the high-end eyewear industry, and was selling glasses for $300-500 that it produced for less than $20. By entering the same supply chains and cutting out middle men and licensers, Warby Parker successfully entered the market based on $95 glasses. Competing on price is tricky and should be done thoughtfully. Amazon is famous for this strategy; they slashed their margins to almost nothing in order to successfully gain a stranglehold on the online retail and book markets. Picking your dimension of competition is critical, and I think a lot of startups would do well to give it more consideration. Knowing exactly why you belong in the market gives your team focus and a sense of purpose that will allow you to increase your value-add to users and ultimately the size of your business. Would you rather be Thomas Newcomen and help invent the steam engine or Andrew Carnegie and use that technology to build a railroad empire? Would you rather be Tim Berners-Lee and be credited with inventing the world wide web (and receive a $1.65 million prize 15 years later) or Mark Zuckerberg and deploy that technology to create a $75 billion social media company? Phrased for the general case, would you rather be an inventor or a deployer of a revolutionary new technology? If you had to pick, you’d probably choose deployer. Chris Dixon wrote a great post about how technological revolutions come in two phases; installation and deployment. Typically, the installation phases happens during a financial bubble when excess resources are poured into a promising new technology. An inevitable financial collapse ensues, followed by a sustained period of growth fueled by the deployment of the new technology. America’s unusual success has largely been fueled by major technological revolutions that have lead to large increases in productivity that unfolded over time. Innovations in manufacturing, transportation, engineering, and energy are examples of giant leaps in technology that resulted in real growth of productivity and quality of life. Technological revolutions increase our national output and well-being in a way incremental improvements in labor and organization efficiency simply cannot. If you are America and want to maximize your success, it is essential to figure out how to create as many of these revolutions as possible. So how do you do that? If America were an individual, it would probably invest time and resources into "installation" technologies – some promising places to start might be artificial intelligence, robotics, nuclear power, or materials science. America would know that many of these investments would never reach the deployment phase, but it would be worth it in the long run because those few successful revolutions would be so incredibly valuable. America, unfortunately, is not an individual, and the inventors who dedicate their lives to making progress in installation types of technologies often don’t enjoy the benefits they seem to deserve. Most installation technologies never reach deployment phase, and even when they do, the inventors rarely reap the same benefits as the deployers. In Homer's The Odyssey, Circe warns Odysseus that when he sails past the sirens, their beautiful singing will draw him in and result in his death. The singing will be so beautiful, in fact, that once he hears it he will still decide to go towards the music even know though he knows it will lead to his certain demise. Knowing that his preferences will change, he orders his men to put wax in their ears and tie him down so that he will be able to hear the music but unable to steer the boat towards it. This is one of the earliest written examples of dynamic inconsistency, the phenomenon in which an individual's preferences are inconsistent over time. We are all too familiar with this in our everyday lives – we wake up in the morning determined to work out and eat healthy food, and cave in late at night to a delicious piece of chocolate cake. What you want right now is often different from what you want most. When you are an individual, if you know that your preference will change over time, you can make decisions that force yourself to do the things you most want. Throw the cake out of your apartment so you can’t eat it late at night. Get ahead on your work on Sunday evening so Monday is better. Pay for a full online course to encourage yourself to see it through. When you are a community, however, it is much harder to do this because individuals are driven by their own well-being, rather than by the well-being of the community. There are two main reasons it’s bad to be an inventor. First, much of the work done never results in a tangible product or service; instead, it’s akin to incremental advances in academic knowledge, which are important in the aggregate but typically yield little benefit for the individual researchers. Second, the period between the installment and deployment phases can take a *really* long time. As John Maynard Keynes said, in the long run we are all dead. Most people don’t want to wait around for decades to watch their inventions be gainfully deployed. Individuals are much better off participating in the deployment phase than the installation phase because of the rapid and sustainable growth, and because many installation phases will hit a dead-end and never make it to deployment. The deployment phase is much less risky and, frankly, easier. This causes people to flock to deployment phases (think about the current deployment rush in tech) rather than installation phases (consider the nascent industry of computer chips and microprocessors). America the individual gets long-term benefits when one person invents a brilliant new technology that another person gainfully deploys many years later. Unfortunately, humans' incentives are typically limited to themselves and those closest to them, so the inventor isn't always be so eager to pour his life into a risky research endeavor that may never pay off. Because the time periods are so long and third party externalities are so relevant, I believe we need to actively encourage work on promising installation technologies. Quantum leaps in robotics, cheap energy, transportation or AI will result in the long-term sustainable growth that has lead to America’s greatness, but how do we get the smartest people to leave their jobs at SnapChat or Goldman Sachs to work on those problems? We know that we will be best off in the long run if we invest time and resources into installation technologies, but because America is not an individual we have to create structures to incentivize the behavior we want. Some of these incentives are already in place. There are academic prizes and government grants, and even in the private sector, Zuckerberg, Milner and Brin teamed up to offer a $3 million reward for breakthroughs in medical research. The 20 under 20 Thiel Fellowship is at least tangentially related. Still, it’s not enough; we could and should be doing much more. Private initiatives are good but there will probably need to be significant government involvement to correct the natural disparity in incentives for being an inventor over a deployer. Until we make it more appealing to focus on inventing for emerging installation phases, people will continue the (relatively) easy and rewarding work of deploying the current revolutions. There are undoubtedly some private forces at work, and inventors can get great joy and satisfaction from their work, and often money too. But until we figure out how to make it as appealing to work on invention as deployment, we are leaving an indeterminate amount of innovation and growth on the table. My mom is a dermatologist and her favorite drug is Accutane. If you haven't heard of it, Accutane is the amazing pill that cures even the most extreme cases of acne. Despite being a wonder drug, Accutane requires a fair amount of explanation for new patients. After 25 years of perfecting her talk, it still takes 10 minutes to touch all the bases. One morning a few weeks ago, right before her first patient of the day, she decided to film this 10 minute explanation on an iPad. Now when she has a new Accutane patient, she hands them the iPad, goes to see another patient, and then comes back to answer any questions that remain. The results have been incredible. Not only do her patients rave about the new video, but she now has more of her most valuable resource: time. Relative to the investment of a few hundred dollars for an iPad and 10 minutes of her time, the payoff has been astronomical. A couple of days after discussing the iPad video with my mom, I reread a discussion about the importance of power law distributions between Peter Thiel, Paul Graham and Roelof Botha. These are the notes from Peter Thiel's class called "Startup" at Stanford business school as recorded by Blake Masters. It's a great read. Power law distributions are really important to understand. The class at Stanford discusses this concept with respect to startup investments: you plot all your investments from best to worst on the x-axis, and your investment returns on the y-axis. Most people expect that this curve would be fairly flat (a linear distribution), implying that the difference between the return of each investment would be about the same. In practice, most venture capital funds live in a world of power laws, where the best investment returns more money than the rest of fund combined, the second best returns more than the rest combined, and so on. Venture capital is one obvious manifestation of power law distributions, but we see this phenomenon all over. 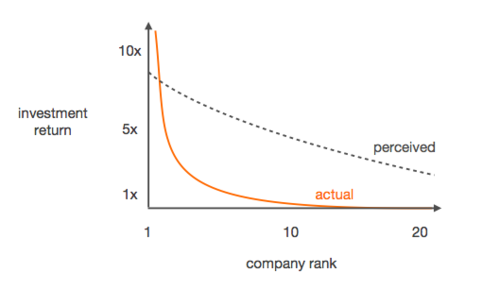 In industries susceptible to the "superstar effect", such as sports, movies, or politics, the outcomes of top performers tend to follow a power law curve. The best baseball player makes a lot more than than the 100th best player, who makes much more than the 1,000th best player. "A-list" actors do dramatically better than "C-list" actors, who do dramatically better than struggling artists in Manhattan. The president has much more power than senators, who have much more power than local officials, who have much more power than me. In my mom's case, if you lined up everything she has done to try and improve her practice's efficiency from best to worst, the payoff from the iPad video would be on the far left of her power law curve. It was probably worth shockingly more to her efficiency than her average improvement. We are all constantly exposed to these kind of curves in our own lives with our investments of money and time. We spend money on a lot of things that don't provide us with that much happiness, but a small number of purchases produce amazing returns for our happiness (think your favorite shirt, an incredible pillow, a perfect gift for a friend, or maybe even the dopamine-releasing iPhone, despite the offsetting high cost). The curve for our time investments is probably even more pronounced. Sometimes we spend hours making little progress on problems that won't even be that helpful if solved, and other times we spend 30 seconds writing an email that turns out to be hugely valuable in our personal or business lives. The important thing to remember is that there are outsized returns for a small number of our "investments", and it's worth a great deal of our time and energy figuring out how we can be more likely to make these investments. For my mom this may mean asking other dermatologist what high impact changes they have recently made in their practices. Almost always, these outliers have an element of unpredictability; you can never know for sure which early stage startup will be worth a billion dollars, which email will be worth a huge multiple of the time it took to write, or what new improvement will make a medical practice drastically more efficient. However, we can reduce this unpredictability by removing focus from the types of investments that almost never have outsized payoffs, and by adding focus to the types that often do. By trying to be acutely aware of what activities have a high likelihood of ending up on the far left of our personal power law curves, we can give ourselves a much better chance to see great returns. Sharing can save a ton of money. We share apartments, cars, and office space with family, friends, and coworkers. We share roads, radio waves, and national defense with fellow citizens. In cases like these, sharing leads to huge economic gain. So why don’t we share more stuff? The problem, and its solution, has to do with ownership. Broadly, the various types of property rights include (i) the right to use a good, (ii) the right to earn an income from the good, (iii) the right to transfer the good to others, and (iv) the right to enforce property rights. The term “ownership” applies to the particular bundle of property rights associated with a certain level of ownership. A property right is the fundamental unit in the broader abstraction of ownership. If you buy a coat, you own it outright and have the complete bundle of property rights. You can sell it, give it away, wear it, burn it, or any other activity you see fit, so long as it does not interfere with others’ rights. By contrast, if you rent an apartment, you have a specific bundle of rights that includes living there and earning income through subleasing, but excludes destroying it or selling it. If you buy a subway card, you have the right to ride a subway a certain number of times, and not much else. Money can be thought of as a way to acquire property rights. But what do we actually want with our money; do we have a fundamental desire to own things? Generally, I would argue no; what we really want is the utility that can be derived from property. Outright ownership is only one way to derive this utility, and usually not the best way. When you purchase a computer, you don’t really need the right to destroy it at any moment, or the right to make sure no one uses it while you're sleeping. But people are rational, so why would they enter into suboptimal transactions? According to the Coase Theorem, as long as transaction costs are zero, bargaining will lead to a maximally efficient allocation of resources no matter the initial allocation. The problem is that transaction costs are rarely zero. Property rights at varying levels below full ownership are often poorly defined (do you know the exact rights your Netflix subscription gives you?) and expensive to enforce. Also, partial ownership rights necessarily imply sharing with others, which comes with a wide range of costs, including moral hazard, transportation costs, psychological unease, and many others. Because proprietary rights (a subset of full ownership rights) can be tricky and expensive, the default is often full ownership rights, even when a smaller bundle of rights would suffice. This leads to massive economic waste. Your TV is off most of the time. Your iPad often goes unused. The majority of your wardrobe is sitting in your closet. Your car sits in the driveway while you travel. There is rampant unnecessary product duplication in all realms of life, simply because people fully own so many things. There are some real problems to sharing our property with others. For instance, relationships are impermanent, so we may not want to buy a house to share with four college buddies (this is a good economic reason in support of marriage; permanent relationships allow people to stop duplicating all their stuff). Many objects like TVs are heavy and impractical to move around (a good reason to start streaming all television through the internet). Moral hazard makes it so that people will be less careful with shared property (a good opportunity for new-age insurance companies). Ownership can be defined in terms of exclusion. Generally, the more rights someone else has to something, the fewer I have. Intuitively, not everything lends itself to sharing equally well. Some goods are rivalrous, which means that one person’s use of a good decreases everyone else’s value. 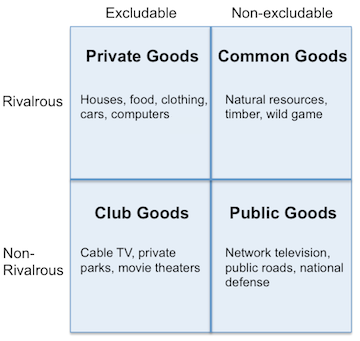 Obviously, companies with offerings in the lower left quadrant of this diagram will most readily thrive in the sharing economy. But I believe technology will decrease transaction costs and open up opportunities across the board. We rarely need the full bundle of property rights. For every good, there is a tension between the cost of full ownership rights and the cost of a subset of proprietary rights plus transaction costs. 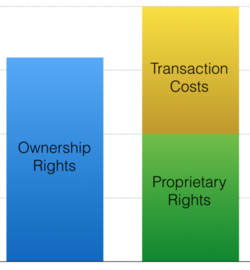 Because proprietary rights are cheaper than ownership rights, companies that reduce transaction costs and provide the correct subset bundle of rights will be very successful. Many companies are already working toward this. Airbnb, Sidecar, Netflix, Rent the Runway, and others have started a shift toward shared ownership and curated property rights. But still, there is room for much more to be done. I suspect that we will continue to see more companies push the sharing economy forward by figuring out ways to reduce transaction costs and help reshape our understanding and expectation of ownership. Twitter went public today, and I couldn't help but feel alarmed. After seeing the 75% valuation pop from $14 billion to $25 billion, my initial condolences went to Twitter. A surge on IPO day is good of course, but 15-20% is more than enough; 75% simply means the company was mis-priced and that Twitter left over a billion in cash on the table. Once my sympathies for Twitter subsided, I began to reflect on a much bigger problem that has been bubbling up in the tech community for the past couple of years, and is being tragically reflected and reinforced by this very public valuation. Startup valuations are, to put it euphemistically, frothy. Valuations are becoming entirely dissociated from intrinsic value, and investors are focusing entirely on reward with almost no regard for risk. Snapchat and Pinterest are worth around $4 billion dollars each. Evernote and Airbnb are each worth over $2 billion. Path is worth $500 million. By comparison, Peabody Energy, the largest coal company in the world which owns almost 10 billion tons of coal, is worth about $5 billion. I understand speculation and risk; it's been my job for the past two years. I know that these companies are still at an early enough stage that investors buy a basket of them hoping that one or two hit it out of the park. Is there a 10% chance Snapchat is worth $40 billion? Maybe, but that's not a bet I would take. "Forget valuation multiples, how does the product make you *feel*?" What worries me most about the valuations of companies like Twitter, Snapchat, and Path isn't the nose-bleed revenue multiples (nevermind positive earnings), but the emotional way the valuations are justified. Today, the Twitterverse is lighting up with investors chattering excitedly about Twitter's reach, impact, connectivity, meaningfulness. "People who think the company is overvalued," they scoff, "just don't get the power of Twitter." I'm worried about the entire startup ecosystem because startup valuations propagate down from the top of the market. This valuation (along with the recent surge in Facebook stock) will send a rising tide of valuations rippling down through the ecosystem until "my friend and I have a pitch deck and an idea for a web app" is worth $10 million. Our tacit understanding is that while early stage investing is a crazy game, public investors do serious diligence and put the company through rigorous financial analysis, so their valuations must be grounded in reality. "So if Twitter is worth $25 billion and its size is X," thinks the VC to himself smugly, "this other startup must be worth $250 million because its size is 0.01X." Because human nature dictates that people have no patience and jealousy problems, the problem fuels itself. Investors see other investors getting rich off of pipe-dreams-turned-billion-dollar-exits, and they want a piece of the action. The only way to get the big returns is to have a piece of the big companies, so the dozen consumer companies that could plausibly go public in the next 12 months receive incredible attention. Emotions run high, valuations run high. Froth begets froth. Maybe Twitter really is fairly valued at $25 billion, and maybe the same is true for Snapchat at $4 billion or Path at $500 million. I'd be shocked, but maybe. The real problem here is that we increasingly live in a world where technology companies are valued on emotional whims and promises of unbelievable future growth. I wasn't paying attention back then, but I feel a hint of what I imagine was running rampant in 1999; excitable, short-sighted investors betting billions of dollars on large audiences with promises of inconceivable growth and eyeball monetization. I'm not calling the top or saying we're in a bubble, but I think we would all do well to step back and think about what valuations actually mean and where they come from. This quote from Warren Buffett always seems to do the trick.